METHODISTS from around the globe have been urged to be “agents of reconciliation and peace” in this fragmented world. 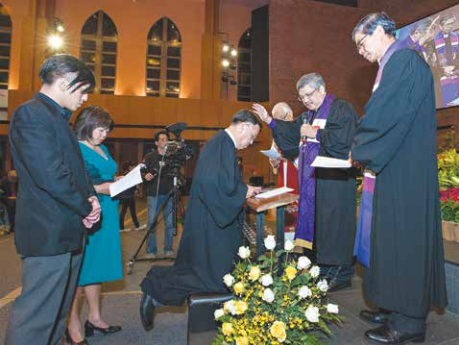 The clarion call came from world Methodist leaders at the 19th World Methodist Conference in Seoul from July 20 to 24, 2006 in the midst of heightened tension on the divided Korean peninsula and the unrest in the Middle East. While about 2,500 conference participants from 132 countries were praying for reconciliation and peace, bombs and rockets were exploding in Israel and Lebanon. And the delegates had come from all parts of the world following North Korea’s recent missile tests. “It is my great hope that this World Methodist Conference in Seoul can extend its clear message of reconciliation to the world, especially on this Korean peninsula. “During the last 61 years of division, the South and North have confronted each other as enemies, and the military threats have continued to this day. However, trusting God’s will, we have been praying diligently with hope for peace and reconciliation. The conference theme was agreed upon as the Programme Committee, headed by Mrs Gillian Kingston from The Methodist Church in Ireland, prayed that the conference would honour God and strengthen the Church’s witness around the world. The theme was partly inspired by the Korean Methodist Church’s invitation to the Methodist family to come to Korea and join Korean Methodists in praying for peace and unification of the divided nation. Strengthening the conference theme was a logo which embodies the four corners of the earth in the shape of the cross, symbolising the reconciliation that God offers all humanity through the death and resurrection of Jesus Christ. The attractive logo was designed by Mr Michael Tan Soo Guan, a member of Bedok Methodist Church. The World Methodist Conference meets once every five years. Through the Methodist/Wesleyan family, 40 million church members are engaged in ministries which reach out to more than 75 million people. 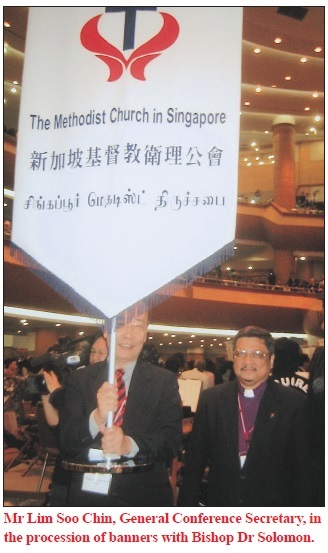 Representing The Methodist Church in Singapore at the World Methodist Council meeting on July 18 and 19 was a four-man team led by Bishop Dr Robert Solomon. The other team members were the Rev Khoo Cheng Hoot, President of the Chinese Annual Conference; Mr Lim Soo Chin, General Conference Secretary; and Mr M. Geevananthan, Lay Leader of Emmanuel Tamil Annual Conference. The meeting was held at the historic Chung Dong First Methodist Church in downtown Seoul – the first Protestant church built in South Korea about 120 years ago. Joining them at the 19th world conference were eight other delegates: The Rev Wee Boon Hup, President of Trinity Annual Conference (TRAC); the Rev James Nagulan, President of Emmanuel Tamil Annual Conference; the Rev Dr Jonathan Seet, District Superintendent (East), TRAC; Mr Kim Seah, Lay Leader, TRAC; Mrs Patricia Khoo, Associate Lay Leader, TRAC; Mrs Laureen Ong, President of General Conference Women’s Society of Christian Service; Dr Lim Swee Hong, Lecturer in Worship, Liturgy and Music at Trinity Theological College; and Mr Peter Teo, Editor of Methodist Message. 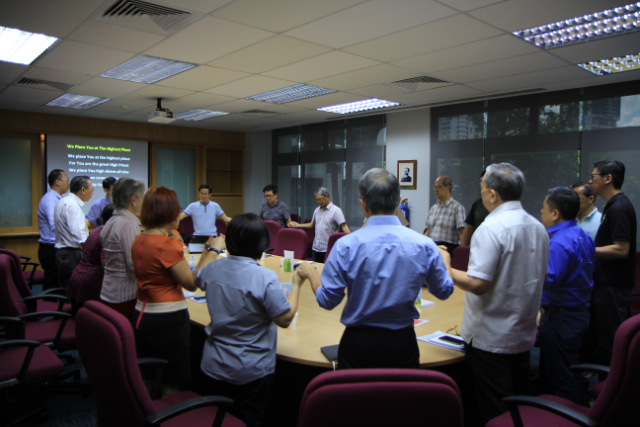 The conference was held at the 12-storey Kum Nan Methodist Church, which has a sanctuary with high-tech audio-visual facilities and a seating capacity for several thousand worshippers. Council, chaired the opening session of the conference. A missionary partner of The Methodist Church in Singapore, he is the Principal of Anglo-Chinese School (International) in Singapore. A procession of colourful banners by heads of the participating delegations signalled the start of the conference with words of welcome from Bishop Sunday Mbang, the outgoing council chairman, and Bishop Shin. Holy Communion was celebrated with Bishop Walter Klaiber, from the Germany Central Conference of the United Methodist Church, as the celebrant. Bishop Mbang was the preacher. The Mayor of Seoul, Mr Oh See Hoon, then brought greetings to the conference. After welcoming the delegates, he reminded them that “we want to be one country again, but challenges from within and outside the country keep us apart”. and the Hezbollah faction in Lebanon. precarious situation and of duty to stand by with my people”. the perspective of a Christian living in South Korea. agreement on the theological issue of justification. officers of the World Methodist Council. 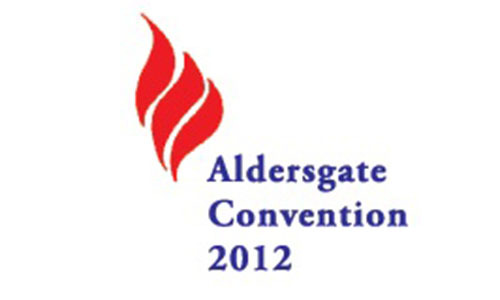 The recession of banners brought the conference to a fitting close on July 24.